What do you think? I've been impressed by the young teams sailing the "floating" Nacra 15 and new that it would transition to full foiling along with the Olympic Nacra 17. But what about this Nacra FCS One, single handed foiler with two sails? I have sailed several foiling boats and would like to try this one. It looks like fun but I want to see how it behaves before drawing conclusions. The N15 looks durable and is a good youth trainer, more forgiving than the higher powered F16's. My concern is its a 310 lb boat, which is a good bit heavier than the F16 (~275 lbs) and nearly twice the weight of an A-Cat (165lbs). Tough to move that around on the beach solo. Certainly in breeze-on conditions and with the option to go back to the C-boards for non-foiling conditions it offers a lot of flexibility which is a good thing, but thats not a light boat to haul up the ramp solo at the end of the day. 310 seems pretty light to me, considering that is much lighter than the Hobie 16, with good beach wheels I get my Hobie 18 on and off the beach solo as long as the slope isn't too bad. Around 300 pounds might be the sweet spot for handling and durability with today's layup techniques. Yes, the 320 lb Hobie 16 can often be managed solo if you have a shallow launch ramp etc., but not all locations are as convenient. The 165 lb A-Cat is plenty easy to handle and much more durable than most folks think. 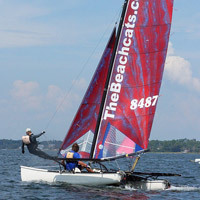 250 lbs would be easy to achieve with modern techniques while keeping costs reasonable, but the original goal of the N15 wasn't a singlehander, rather a durable youth trainer for the Nacra 17 which it does well. This is a reasonable option for mom/dad who want to foil when the kids aren't using the boat. Last edited by JeffS; 11/17/18 04:42 PM. I wasn't suggesting the A as a youth boat, its not really great for that as while it can take a fair bit of owner-level abuse the N15 was conceived to be used in a club setting. We know that club boats tend to get abused which is why the N15 is on the porky i.e durable side. I myself prefer sailing 2 up as well for the social aspect but the A is a darn fun foiler. If you want to support youth sailing then sure, go for the 2 up N15 and take the kids for a spin. What i'm still struggling with is exactly how the 1 man N15 w/ DS main fits into the bigger picture, again I suspect its for the moms/dads who want to go foiling, are already consider an N15 for little johnny and this get them 2 boats in one essentially. I just don't see it being all that popular with adult sailors but I could be wrong! If 310 lbs is too heavy then you should put your tea party set away and hit the gym. Keyboard sailors are always faster in all conditions. I know I have a different perspective; I think it is way too small. I started on a Nacra 5.8 at 16 years old racing against adults, but I was 195#. I understand the push for youth to have their own racing program. I look at these as if my kids would sail/race one. I guess the issue I see is the skill needed to sail foilers. The US seems to have a youth program idea to stick kids on Optis, then Laser, then 420s.. and then what? By the time these kids are racing the 420s, they are already too far behind the curve to gain the skill needed to race a foiler successfully. I could be wrong... I know there are a few that are natural enough to race a foiler, but "we" are expected to buy a $30k-ish foiling toy for a couple of kids of limited experience to race. I did see where some father/son teams racing these. I guess if the adult is maybe 150#, but that weight is unrealistic to me. To me, the 310# boat weight seems a bit high for a 15 foot boat. 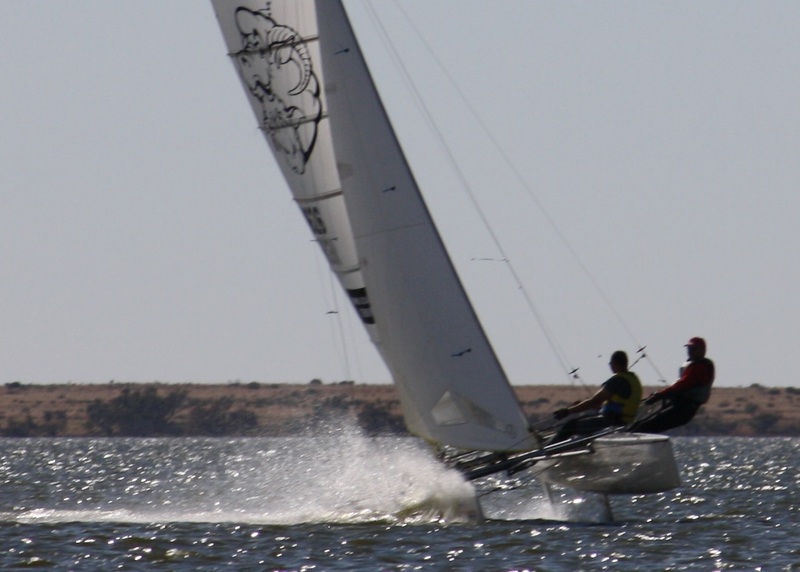 If a Hobie 16 weighs 320#, they have not come very far in weight reduction over the years. I apologize for the long rant... but there are other boats that are better suited to get kids on the water.